It is not a secret that new media have greatly changed how we function as journalists. We rely less on the tried and true methods that brought journalism to the forefront and more on technology to help us do our jobs. 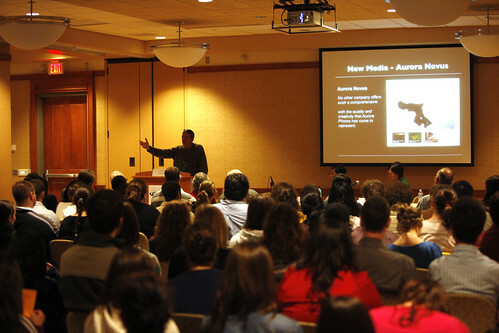 Jose Azel of Aurora and Quanta Productions discusses the changing landscape of media at the 2010 Schuneman Symposium. Social media, such as Facebook, Twitter and Digg, have impacted the way we perform our day-to-day jobs. Before new media came into our lives, journalists had to hunt down leads, exploring their cities and making vital contacts. New media have changed that immensely. With a click of the mouse, journalists can email all their sources, set up interviews and find an interesting story lead without leaving the office chair. With the onslaught of new media, journalists have to tell their stories in more than just hard text. The use of multimedia is vital to storytelling. Journalists no longer have to be writers; they also have to be a one-man band, taking video and pictures while still getting the story. Visual storytellers must be able to express with images everything that a writer would express with words. Effective storytelling must be compelling and dynamic; there is no room for failure. The images have to be powerful, otherwise the message is lost. Visual storytelling, however, may be the one way new media have improved journalism. With technology, journalists can tell a story not only through the powerful images they capture, but also with interactive maps and graphics, audio and video. The point is to keep readers engaged in the story at hand. That means that not only to journalists have to find new ways to tell their stories, but find new ways to get the story out there. With the addition of new technology and how readily available it is, anyone can take photos or videos. The average man or woman can film video or take pictures of a breaking event before the newsroom is even aware. In light of all this change, journalists are taking the reins and evolving to survive in this new media world. Shawn Rocco, a staff photojournalist with the News & Observer in Raleigh, N.C., is doing amazing things with his blog Cellular Obscura, in which all the photographs are taken with his cell phone camera. Ariana Huffington started the number one news blog on Technorati, The Huffington Post. Newspapers, such as the Las Vegas Sun, have started interactive websites with videos, pictures and interactive maps. It is the job of journalists to continuously adapt and evolve with the world around them. So, as new media continue to grow, so must journalists. New media have forever affected visual storytelling, for better or worse.